Hiking Down the Bunny Trail! It feels like summer is here! 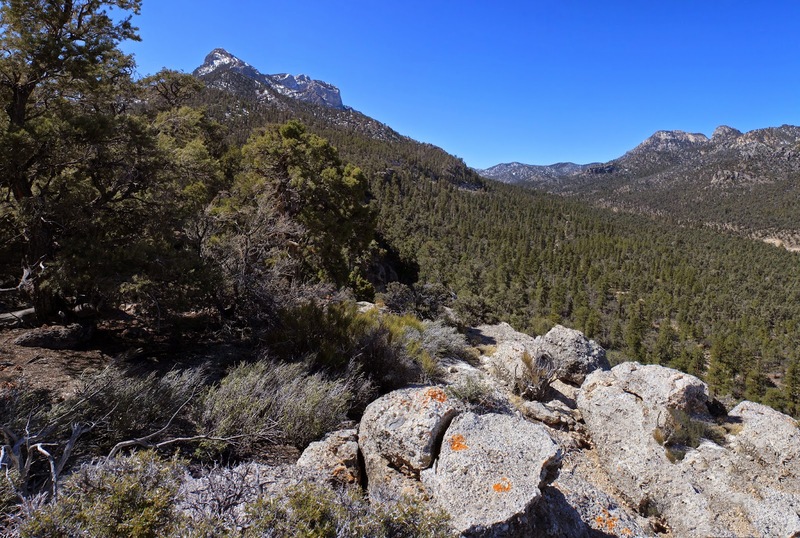 Looking for a cool place to hike, three hikers ventured into the Spring Mountains for an exploratory hike. When we got out of the car at the Lee Canyon trailhead (the solar panels), we felt a bit over-dressed in our pants and long-sleeved shirts! Yes, it was that warm! Luckily, there was a cool refreshing breeze throughout the hike and lots of shade to make the day very comfortable. We dropped down into Lee Canyon and followed the nice new trail over to the trail junction where we turned to our right heading up canyon. The trail was only completed last summer, but it has become a favorite of hikers and horse riders already. 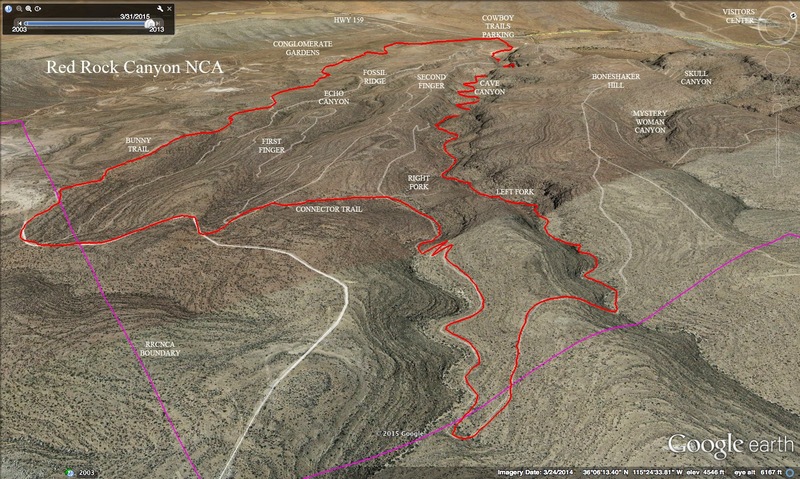 At around 0.65 miles, we crossed a small wash as seen in the photo above. In a few more short steps, we realized that this was the turn we were looking for. This gravel wash leads up to the left into a fork canyon off of the main Lee Canyon. Thus, our exploration began! Surprisingly, the gravel in the wash was somewhat deep causing our trudge up the gentle slope to be slow. The wash was free from brush for the most part and there was evidence that we were not the first hikers (or horse riders) that have explored this area. Keeping our eye on the slopes up to our right, we passed a few different "ramps" or "troughs" up to the ridge above. 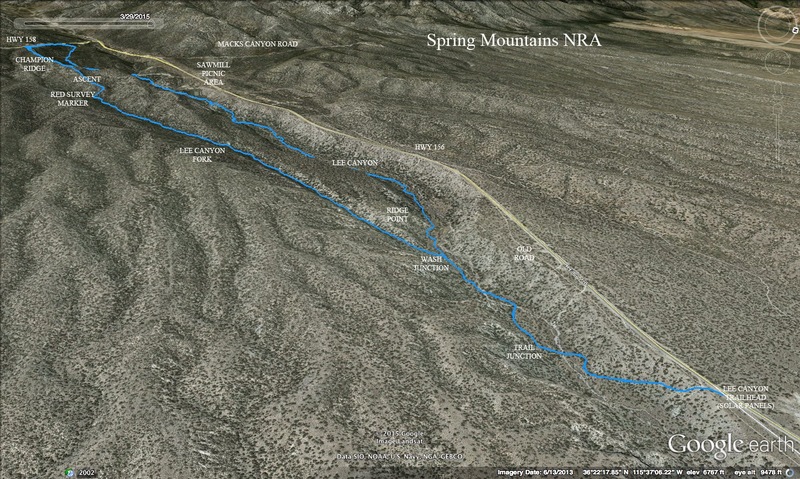 We were looking for a particular "ramp" that would take us up to Champion Ridge, a rimrocked ridge that hangs above the Champion Road primitive camping area below. The wash becomes very wide at 2.2 miles into the hike. This is the ramp area. We, again, passed our queue by a few steps and found a very good landmark for the climb up. There was a red survey marker, as seen in the photo above, placed about 30 feet up from the wash on the right side. Not yet realizing that we were so close to our "ramp," we decided to climb up to the ridge here since there was not too much brush in our way. When we reached the ridge, we saw the ramp on the other side and found that our "mistake" was probably a lucky break. The ramp wash was filled with brush and sometimes impassable. Our best bet was to follow the ascent ridge up to our left. A couple of times, we tried dropping down into the ramp wash when we leveled off with it, but each time, we had to return to the ridge due to brush. Finally, we reached the top ... the northeast end of Champion Ridge. 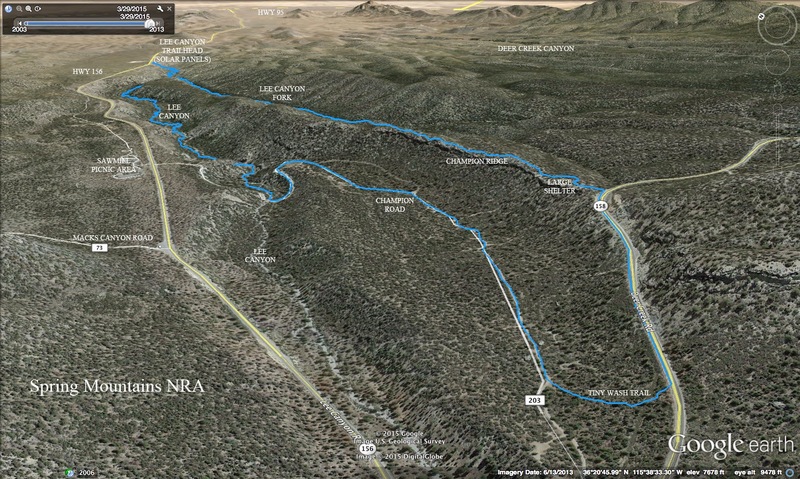 From here, we weaved in and out of the trees and walked along the rimrock that overlooked Lee Canyon. We could see the Sisters and Mummy's Nose from the cliffs. 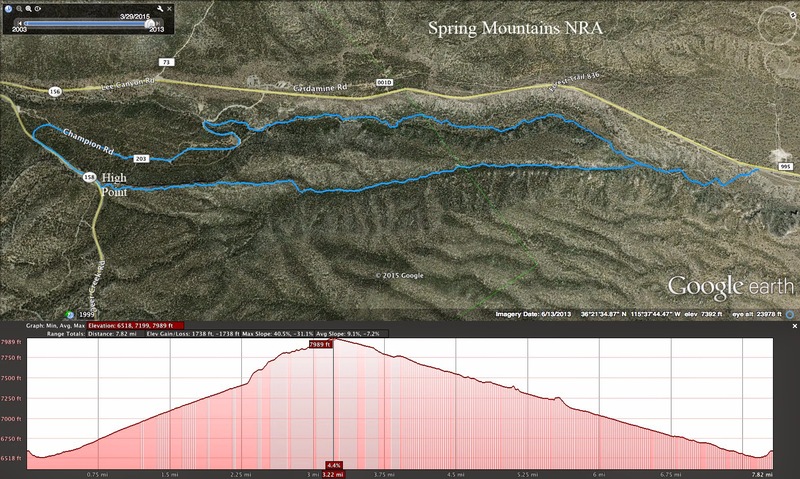 Near the southwest end of the half mile of Champion Ridge, we came to a large shelter built not far from Deer Creek Road. Here, we sat on the cliff and took our break. After the break, we dropped down to the paved highway right at the 8000 foot elevation sign. This is where we saw our first patches of icy snow up close. Only patches. We had been constantly looking for a trail down to Champion Road but the terrain is so steep that we were obliged to walk down the road for around a third of a mile. A tiny wash appeared and we followed it down to the dirt road. Turning right, we followed the dirt road all the way down to where it crossed the Lee Canyon wash. We had only seen one camper on the way ... and she wasn't talking .... We turned right to go down the wide wash and wound our way through the conglomerate sculptures. At the antique car relics, we crossed over to the trail on the left side of the wash. This trail is the other end of the trail we began on three hours earlier. 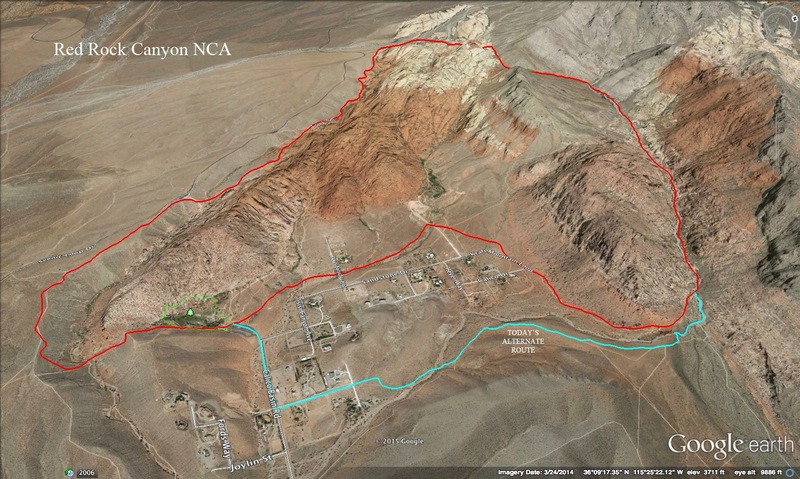 Fourteen hikers opted for a moderately strenuous hike around the Calico Hills and down through Gateway Canyon. 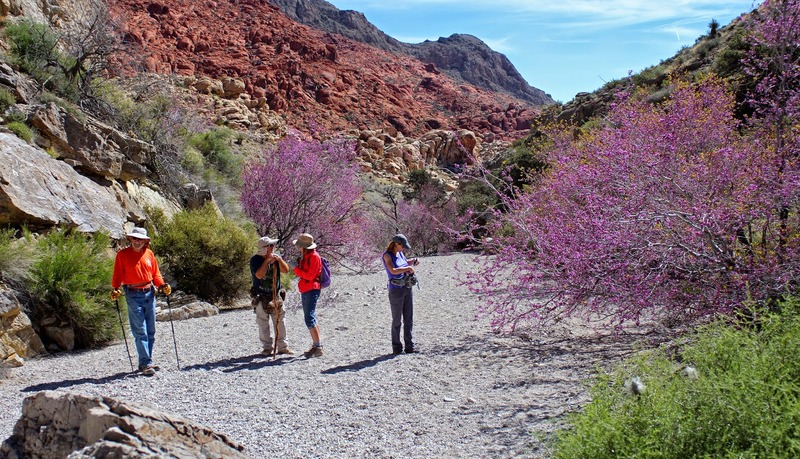 The loop hike begins and ends at the Red Springs Park in Calico Basin of the Red Rock Canyon NCA. We started by climbing the hill above the boardwalk and our hearts and lungs screamed at the early morning effort. Once we were on the saddle, we dipped back down the other side then climbed up again. This time, we veered off to the right about half way up. By the time we finished climbing ... temporarily ... we were located across the canyon from the southern tip of the Calico Hills as seen in the photo above. 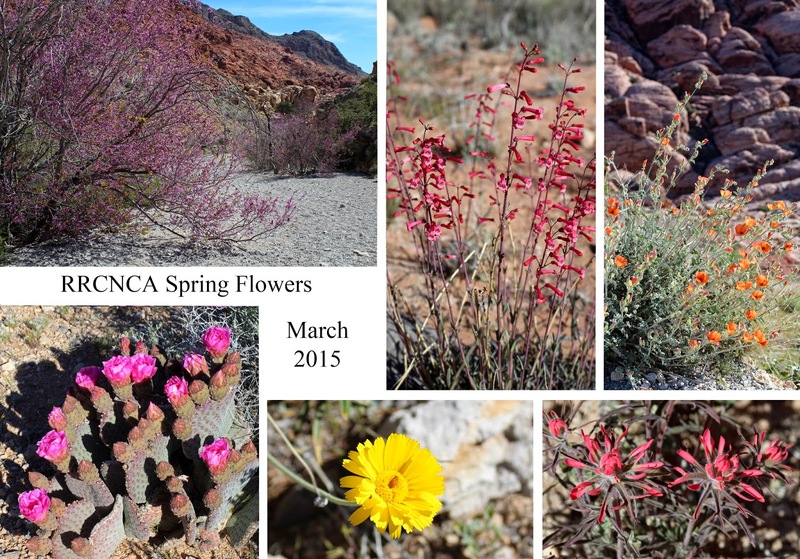 As we hiked on up to the Calico I turnout, we began to notice that some of the spring flowers have sprung! First came a beautiful display of beavertail cactus blooms. 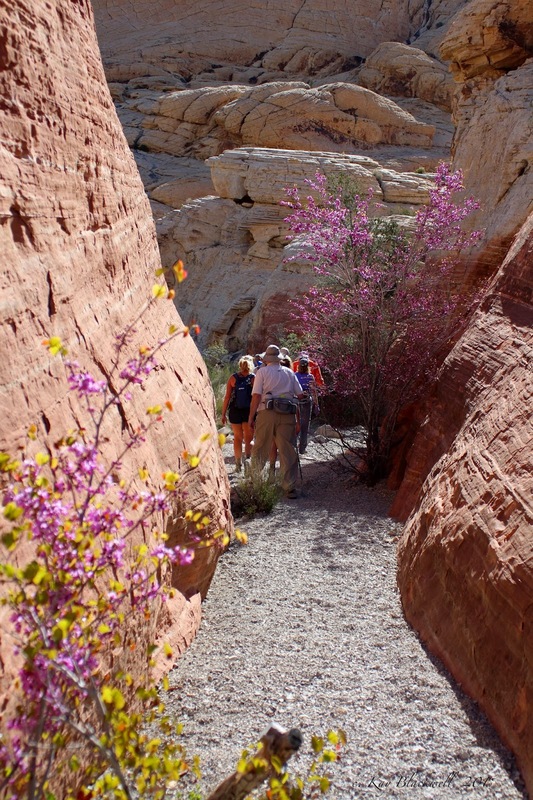 Other flowers we saw along the trail were Utah penstemons, globemallow, paintbrush, desert marigolds and redbud trees. 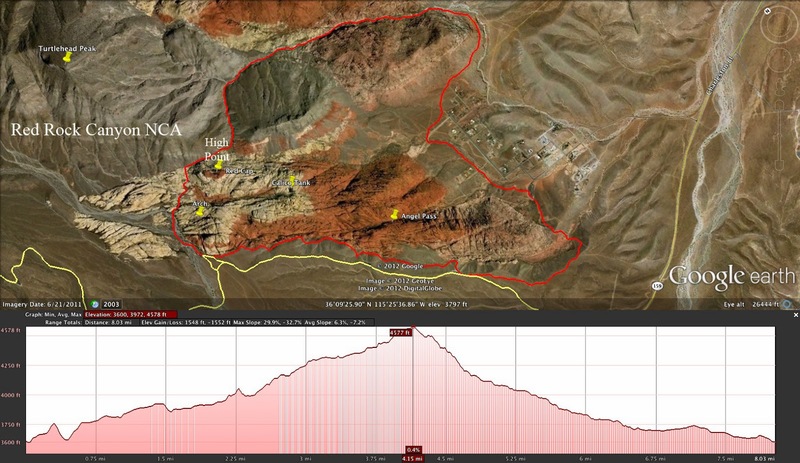 We hiked from Calico I to Sandstone Quarry using the Grand Circle Trail with the exception of a small detour up to the Calico II turnout to offer a restroom stop. It was a beautiful day with a nice breeze to cool us off. There was still some water in the tinajas just south of the Sandstone Quarry parking lot. 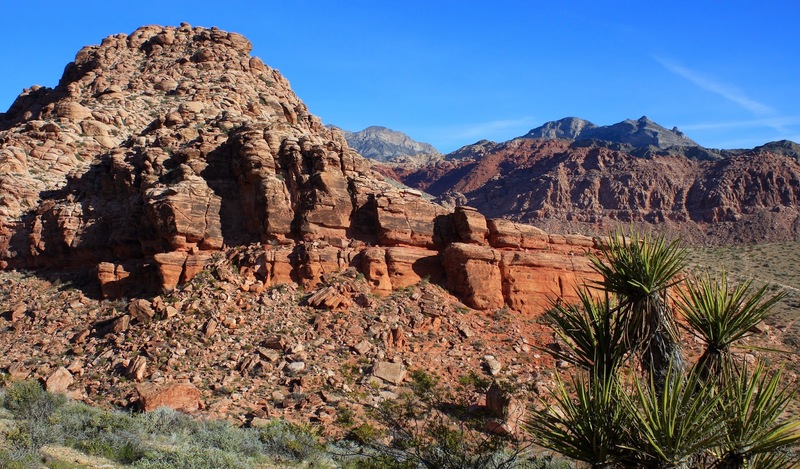 When we reached the sandstone quarry, we stopped for a short restroom break then continued down the Calico Tanks Trail. Leaving the official trail, we made our way over to the Rattlesnake Trail through a maze of sandstone using the small slot canyon to gain entrance to the sandstone ledges where we took our break. 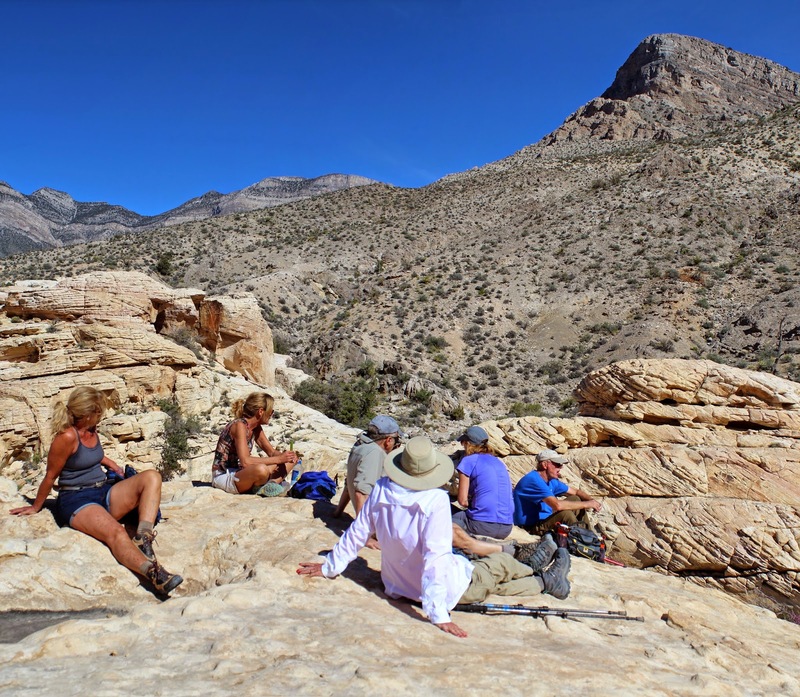 We sat under the gaze of Turtlehead Peak and took in the gorgeous view of the immediate sandstone and the escarpment sandstone beyond. 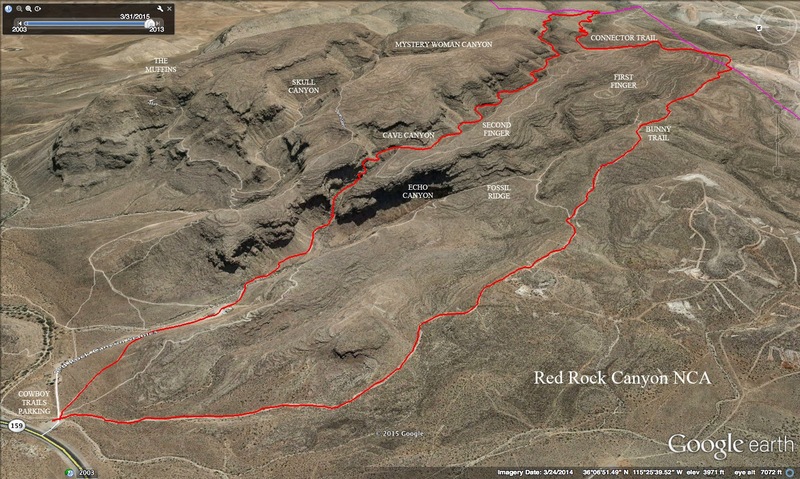 We could see the peaks of the escarpment starting with Rainbow Peak all the way up to the Lost Creek Canyon. This is one of the most beautiful views in the northern Calico Hills because of the wide expanse of color. Here, we also had our choice of sun or shade in which to spend our time. After the break, we connected with the Rattlesnake Trail and hiked on out to the base of the Red Cap Peak above. Turning the corner there, we hiked down toward the Ash Canyon overlook and veered left to go down through the Rattlesnake wash. Gray Cap, a limestone peak on top of yellow sandstone, can be seen from this wash. At the bottom of the wash, we junctioned with Gateway Canyon. A turn to the left would take you into Upper Gateway Canyon. Today, we took the right turn to drop into Lower Gateway. 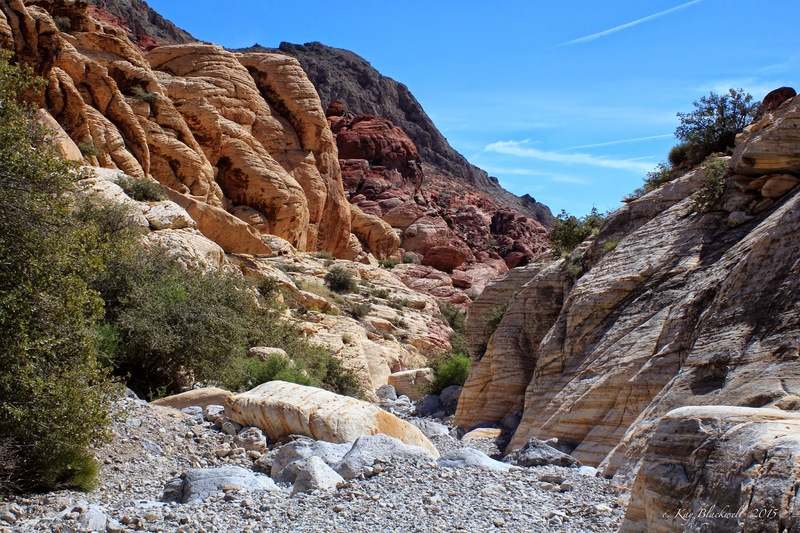 We could tell immediately that the gravel in the canyon was, again, rearranged! 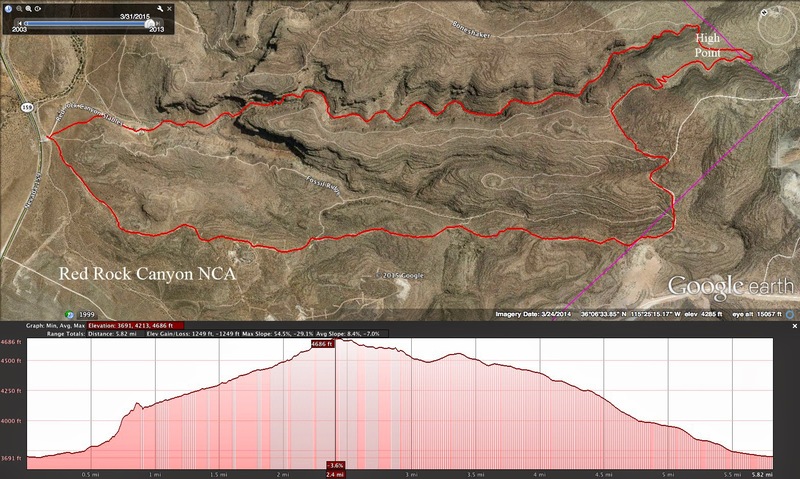 Gateway Canyon is always interesting due to its dynamic nature. The canyon quite often gets a cleaning from rainwater. 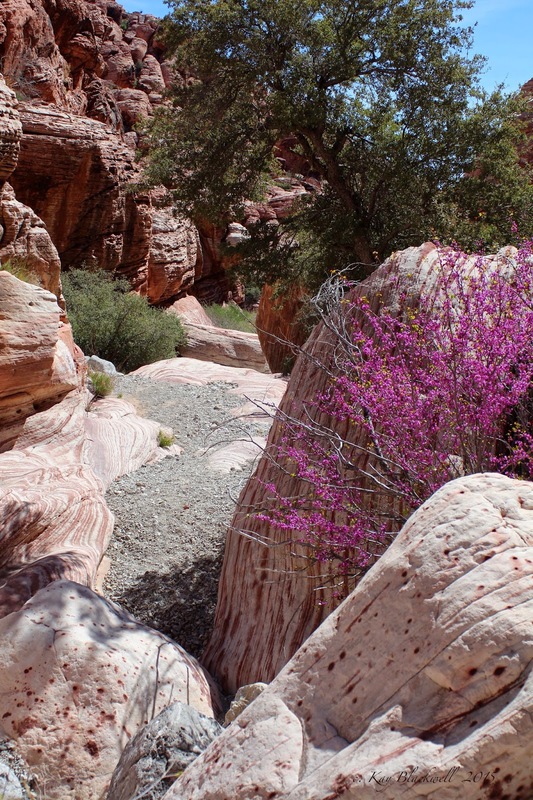 Sometimes hiking obstacles are deep and sometimes the canyon will be a "walk in the park." We passed a grouping of redbud trees in full flower and marched down through the deep gravel. When we got to the obstacle areas, we slowed down and enjoyed the ride as we made sure that everyone got through safely. 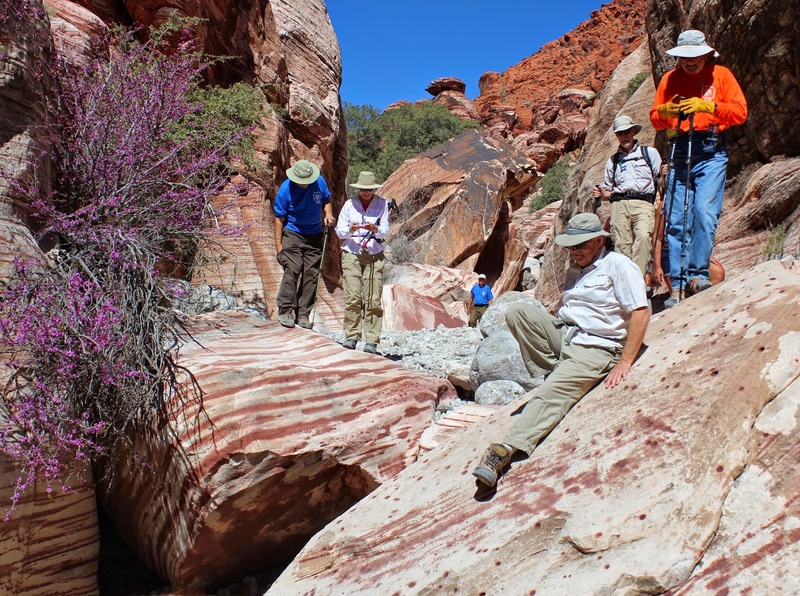 At the bottom of the canyon, we continued out the wash all the way to the high dry fall in the bright red stone. 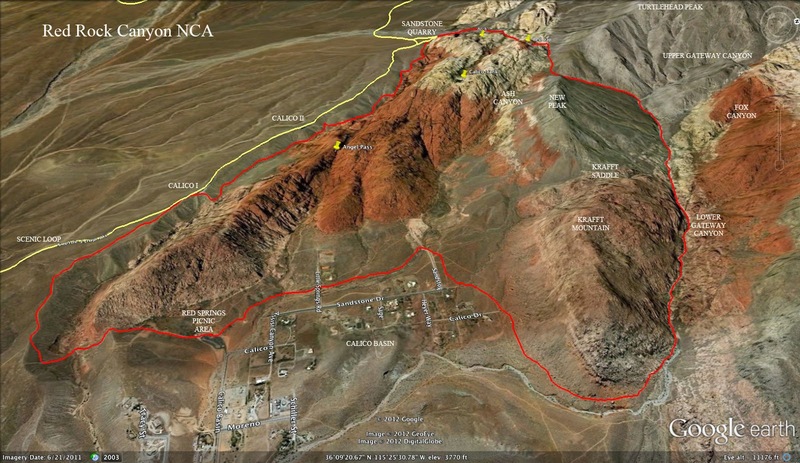 From there, we chose to return to the cars a new way that took us behind some of the houses in Calico Basin and back to the entrance road. Great hike. The blue line shows today's alternate route.